I’m usually more of a savoury snacker when it comes to guilty pleasures, but there’s just something about macarons that I can never resist. After seeing so many pins on pinterest claiming that making them yourself isn’t THAT hard… I decided I’d give it a try. We found a basic macaron recipe from The food network and altered it a bit. Combine icing sugar and almond flour in a bowl and mix together. Than sift the mixture so that any large pieces of almonds don’t end up in your batter. You’ll may end up with as much as 2 tablespoons that is too big to use. Take a teaspoon of Shades of earl grey tea leaves and chop it up so it’s more fine and add it to the almond icing sugar mix. Beat the egg whites on medium high speed until frothy. Then add the caster sugar to the egg froth and continue to beat until you get stiff shiny peaks. This will take about 5 more minutes using a stand mixer. Fold in the almond, icing sugar, tea mix into the egg whites. You can also add in any food colouring now if you would like. Keep folding just until the batter is smooth and slides off the spatula in ribbons. Don’t overmix to the point that it’s runny or else you will have flat cookies. If you undermix it, your cookies are more likely to crack. Spoon the mixture into a piping bag with a round tip. We used a 1/4 inch round tip but a 1/2 inch tip might work better. Pipe circles on to your parchment paper lined baking sheets. Then firmly with both hands pick up the baking sheets and rap them against the counter at least 2 times. Then rotate the pan and do the same thing. This will help prevent cracking of the shells. Leave the cookies out to dry for about 15-30 mins until they are no longer sticky to the touch. This will help them keep their shape during baking. Pop it in the oven for about 20 mins. You should be able to peel the cookie off the sheet easily and cleanly. If some of it sticks, than it’s not quite ready. Let them cool completely before removing them from the sheet. Beat the butter so it’s a little fluffy and slowly add in the sugar. Beat until it’s fluffy. Then add in the honey. Then add your icing to a piping bag and pipe on to one macaron shell and cover with a second one. Voila! Now sit back with your favourite cup of tea and indulge! Check out the video to see each step of the process! Good luck and let me know how your macarons turned out. 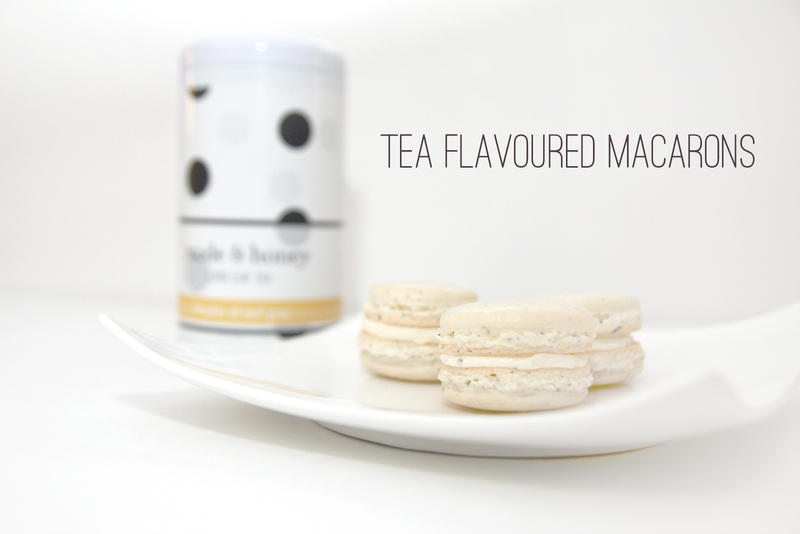 mmmmm I love tea and macarons! These are a great idea. Thanks for the recipe.